What should I do if I get broken bulbs, bad bulbs or the string lights stopped working after a period of time? Your satisfaction is our first goal, every Cymas product includes a 45 days money back and 18-month warranty. 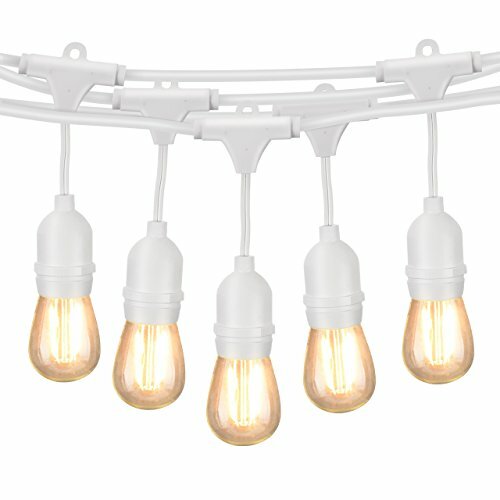 How to install this string lights? Does the string lights waterproof? TRANSFORM YOUR BACKYARD INTO A BISTRO & DIMMER COMPATIBLE: The outdoor string lights create a warm soft ambiance to mesmerize your family and guests with their nostalgic glow. A perfect string light for deck, porch, patio, garden, gazebo or pergola lighting when you have a dinner, party or wedding banquets outside (Please note: dimmer not included). ENERGY SAVING LIGHTING & 15 HANGING SOCKETS: 16 LED power saved light bulbs (1.5 watt each, 22.5W in total, 1 Spare Bulb) with 49 feet heavy-duty flexible rubber strand. The distance between the bulbs is 3.2 feet. LED bulb is BRIGHT enough, please prevail in kind. And LED string lights has a longer lifespan than incandescent string lights. WEATHER-TIGHT & CONNECTABLE: IP65 waterproof level, layers of insulation protect the strand from summer heat and winter cold as well as rainy, windy, or damp climates. Confidently leave on display year-round. End-to-end connections up to 23 strands, feel free to customize your arrangements. EASY TO INSTALLATION: Heavy-Duty strands, you can use cup hooks, guide wires, or zip ties with the built-in loops (Diameter: 6mm) to hang perfectly. With just a few minutes, you can finish it. NOTE: We recommend you install strand with empty sockets to avoid bulb damaged. When connect one with another, please push hard to tighten the connector. You'd better to twine the joint with electricians tape as they are Heavy-Duty strands. UL LISTED & WORRY FREE PURCHASE: Package contains 16pcs LED Bulbs, 1 piece 49 feet strand with 15 sockets and user guide. Your satisfaction is our first goal. Every string lights includes a 45 days money back and 18-month warranty.